Feeling fat, fatigued, forgetful, foggy, slow and constipated? These are symptoms of an underactive thyroid. The health of your thyroid is affected by your diet. If you have these symptoms, following an underactive thyroid diet may heal your thyroid gland and prevent the need for thyroid hormones. Certain nutrients are essential for proper thyroid function. Iodine is needed for the production of thyroid hormones Thyroxine (T4) and Triiodothyronine (T3) in the thyroid gland. Selenium-based proteins help to convert T4 into the more active T3 hormone..
Zinc (Zn), iron (Fe), and copper (CU) are vital to thyroid function. Low zinc can cause T4, T3, and thyroid stimulating hormone (TSH) to also become low. Iron must be replaced to repair the thyroid imbalance when there is iodine deficiency and copper is necessary for TSH and T4 production. Cruciferous vegetables, such as broccoli, bok choy, Brussels sprouts cabbage, cauliflower, kale, radishes and turnips can block the thyroid’s ability to absorb iodine. Since iodine is essential for normal thyroid hormone production, people who have an iodine deficiency can become hypothyroid when eating too many cruciferous vegetables unless they cook them and/or take an iodine supplement or pair them with foods that have a high iodine content. An underactive thyroid diet would include these very healthy and beneficial vegetables in cooked form along with seafood, sea vegetables or iodized salt. Eating small amounts has no adverse effect on thyroid function. Gluten is associated with Hashimoto’s Thyroiditis. Hashimoto’s is the most common cause of thyroid diseases in children and adolescents and it is also the most common cause of acquired hypothyroidism with or without goiter. Gluten can irritate the intestinal lining and leak into the bloodstream and form immune complexes. These can mimic thyroglobulin and form antibodies that attack the thyroid gland or other structures. Therefore, people with any autoimmune disorder, especially those with Grave’s disease or Hashimoto’ should follow an underactive thyroid diet which is free of gluten. Soy interferes with the enzyme thyroperoxidase that converts T4 the less active thyroid hormone into T3 the more active thyroid hormone. Iodine deficiency greatly increases soy antithyroid effects, whereas iodine supplementation is protective when eating soy. Therefore, if you eat soy for other protective benefits, be sure your iodine levels are sufficient. It is best to measure iodine levels in a 24 hour urine iodine challenge. 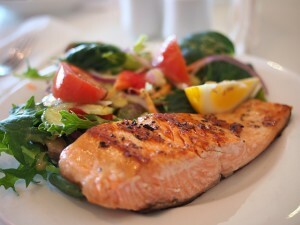 Fish: Fish is a good source of selenium which helps decrease inflammation and is most concentrated in the thyroid. Some fish such as haddock, clams, salmon, shrimp, oysters and sardines are high in iodine, which is essential to make thyroid hormone. Nuts: Nuts are also a great source of selenium and are essential for an underactive thyroid diet. Brazil, macadamia, and hazelnuts are high in selenium. Sea Vegetables: Sea vegetables such as kelp, nori, kombu, dulse, arame, wakame, hijiki are rich in iodine as well as Vitamin C and iron. They can be found in many Asian markets and have anti inflammatory effects. They can also be helpful for people with arthritis as well as those on an underactive thyroid diet. Even if you follow an underactive thyroid diet, you may need thyroid replacement. Many foods, medications and supplements interfere with thyroid hormone absorption. Thyroid hormones should always be taken on an empty stomach. If you are on thyroid replacement and your levels fluctuate a lot or are not stable, it may be how you are taking thyroid hormone. People on thyroid hormone should avoid taking it with fat, sugar, alcohol, coffee and fiber. In other words, always take your thyroid hormone an hour before or two hours after meals and do not take it with any other medications or supplements. Following an underactive thyroid diet can preserve thyroid function and prevent or eliminate the need for thyroid hormones in many cases. In the event you may need thyroid hormone, an underactive thyroid diet can help you stay on the lowest doses and keep your thyroid hormone level stable. Be sure you have sufficient nutrients and don’t take iodine unless you are truly deficient. Too much iodine can cause hypothyroidism as well. Get a 24 hour urine iodine challenge and an evaluation by a functional medicine doctor to determine how well your thyroid is functioning and if an underactive thyroid diet or thyroid hormone replacement is right for you.